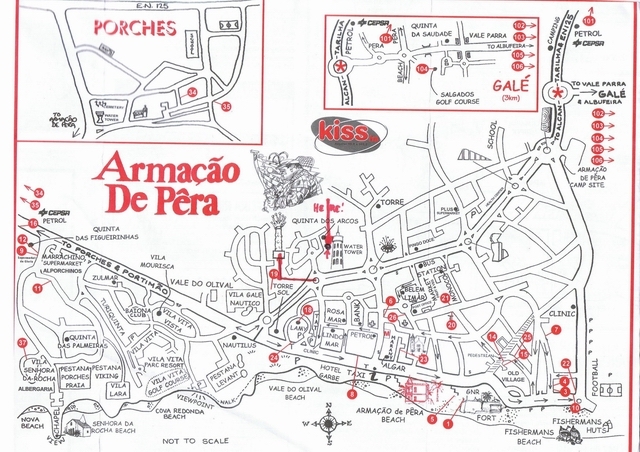 Local Map of Armação de Péra showing the location of the apartment. Armação de Péra is approximately 40km from Faro Airport and takes about 40 minutes to reach the apartment. The main route is via the motorway (A22), Note however, in summer 2011 the government introduced a motorway Toll, so an alternative route is the N125 (this however can take longer). Directions to the apartment will be sent prior to your arrival along with our information pack. Should you want to hire a car there are lots of places at the airport or you can book on-line. There are links to the best ones from our "Useful Links" page. You can travel to & from Faro Airport by taxi or by pre-arranged transfer: Taxi fares can vary between 40€ and 70€ each way, however we can recommend some transfer companies who have proved to be reliable; (See our "Useful Links" page for our recommended transfers). You can travel from Faro by Train, however, there are NO direct trains to Armação de Péra; the nearest train stop is Albufeira - Ferreiras which is about 8-10km away, however, you will need to complete the journey by Bus or Taxi. Alternatively, you can travel from Faro to Armação de Péra by Bus; but you will need to get to Faro bus station which is by the marina. (You should be able to get the shuttle bus or a taxi for a reasonable charge). There are several drop off points around Armação de Péra but the best one for the apartment is by the 'Holiday Inn' bus stop. It is then a short stroll to the apartment. To check train timetables visit the CP (Comboios De Portugal) website at www.cp.pt and select 'Regional' or 'Intra-rail' to get the timetable for Albufeira - Ferreiras. For the bus timetables visit www.eva-bus.com Most of it is available in English except the 'frequency' on the tables. (Days of the week: Monday is the 2nd day of the week - '2as'- and Friday is the 6th day; 'Diariamente' is daily and 'Feriados' is holidays; For example you may see '2as, 3as, 4as, 5as, 6as excepto feriados' so week days except holidays. Cost is approx €4.50 each way per person.